Okay, so I’m doing this post because it interests me (thanks, Houston Rockets Mania Blog for the inspiration) and for Duke this year, there are many, many weapons offensively and defensively. It’s pick your poison for an opposing coach, in reality, but which 5 poisons should get the start? There’s also the fact that between the draft and the NCAA’s four-season limit, last year’s usual starting lineup (when Alex O’Connell didn’t get the start) is GONE. It’ll be hard to see a Duke starting lineup without Grayson, but here we go anyway. First: The 2017-18 Lineup but Younger! 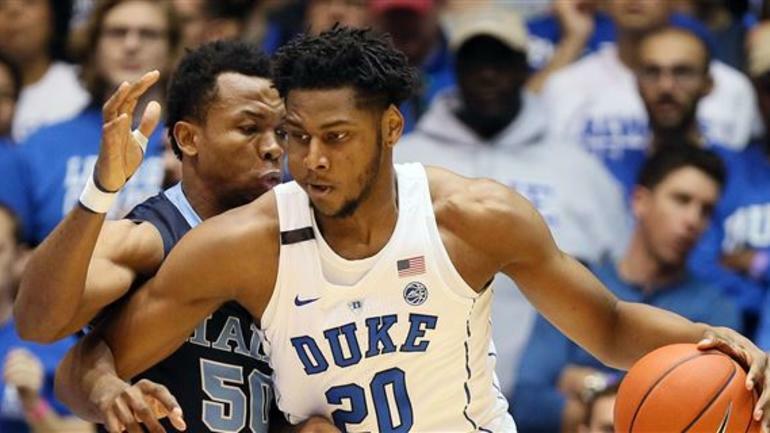 Marques Bolden (20). Courtesy: CBS Sports. Bolden never got much time to shine last season between injuries and future NBA star Wendell Carter, and he is a really, really good player. We need him to be able to break out this season, and giving him room to do so is a good way to start. Bolden would also be the only player with any experience whatsoever. He’ll be a junior next year (how the heck did THAT happen?) and will have to help lead the team, alongside fellow junior Javin DeLaurier and (gasp!) seniors Antonio Vrankovic, Brennan Besser, and Justin Robinson (again, how is four years so short all of a sudden?). Having a veteran (well, kind of) in the starting lineup will be very helpful next season. That would be fun. I don’t really know how developed Joey Baker is after reclassifying from the 2019 class, but, hey, he could be. However, I think they’ll probably use him as a sixth or seventh man. However, it would be an extremely vulnerable lineup seeing as no one of them has any experience whatsoever. I doubt we see this lineup much if at all this season. Third: A Grayson Allen-esque Breakout? Alex O’Connell. Courtesy: Duke Athletics. If you remember, in 2016 Grayson Allen had a breakout year in which he averaged 21 points. Really, the breakout happened during the National Championship game in 2015, but that carried out into his next season. He got a lot stronger between those seasons, gaining some weight and assuming his position as a leader and a difference maker on that squad that made it to the Sweet Sixteen. That could be Alex O’Connell this year. He’s a good shooter, but he’s very wiry and has little to no bulk on him. Maybe this season will be a breakout for Alex. Javin DeLaurier (left) and Marques Bolden (right). Courtesy: Duke Athletics. This lineup throws another piece into the puzzle: Javin DeLaurier. His versatile game is in need of improvement, but with some hard work, he could become a difference maker for the Blue Devils. He’s very athletic which makes him an intriguing figure. Can he use that athleticism in a beneficial manner on the offensive end as much as he does defensively? We’ll see. Meanwhile, he will almost definitely continue to be a great teammate as always. He’s always come off as a really great guy to be around because of his dedication to the team. Obviously, there are plenty more possibilities for this loaded team. Regardless, this is one of the most talented teams we’ve seen in a while (which we seem to say every year).